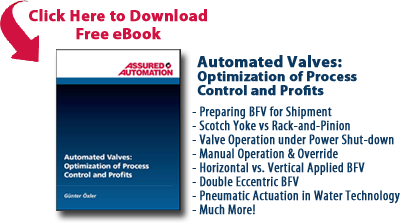 Watch Assured Automation’s Angle Valve Product Demonstration. Angle Valves are used in applications that require a high number of cycles, and where a full port valve is not required. Angle Valves are normally less expensive than pneumatically actuated ball valves. Angle Valves are used in applications that require a high number of cycles and where a full ported valve is not required. They are normally less expensive than pneumatically actuated ball valves. The Ares and Zeus Angle Valves have been tested to millions of cycles. The number of cycles depends on the duty cycle, the pressure, the temperature, and primarily whether the media passing through the valve is clean or has particulate present. The Ares Valve has a 316 Stainless Steel body, plug and shaft with a self-centering PTFE seat. The Zeus Valve has a bronze body with a stainless steel shaft and plug and self-centering PTFE seat. For liquid application the flow should be from 2 to 1 so the fluid flows against the plug. This eliminates water hammering. The Angle Valve has a NAMUR mounting pad which allows for direct mounting of NAMUR style solenoid valves. The Angle Valve products page provides you with links to all the important information available. We will go through them quickly. The Angle Valve Configurator makes the selection process easy, and provides the price, model number and allows you to select the proper accessories. If you add the selection to the cart you can then print a quote or email it. 3D CAD link allows you to download CAD drawings in a variety of different formats. The icons at the bottom of the page lead you to information on the steam, cross-section, and accessories. The Interactive demo shows you how the Angle Valve works and flow direction recommendations. The literature section gives you links to datasheets, price lists, and installation and maintenance manuals. If you require specific information, visit the links or call our office for assistance on Angle Valve applications. Thank you. This entry was posted in Installation and Training and tagged 3D CAD Drawings, Angle Valves, Ares & Zeus Series, Automated On-Off Valves, Bi-Directional Flow, Bronze Valves, Gas Valves, High Cycle Life Valves, Pneumatic Piston Valves, Stainless Steel Valves, Steam Valves, Water Valves. Bookmark the permalink.